I love trying recipes that use freshly grated nutmeg. The fragrance in the kitchen is intoxicating! Also, any excuse to use my mom’s old nutmeg grinder is always fun. The muffins themselves are ordinary and plain-looking, but one bite and you will be sold on the flavor. You can see flecks of the nutmeg throughout the muffins. They are made with cream and whole milk which makes them rich and cake-like. Spread on some softened sweet butter and breakfast is ready. Fresh nutmeg makes all the difference. 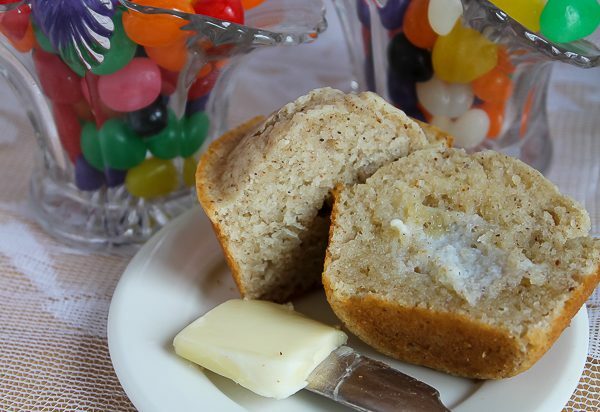 Of course, it doesn’t have to be Easter to enjoy these muffins. Anytime is great, along with a nice cup of coffee. I love nutmeg, but it occurred to me that I should also try these with freshly crushed cardamom seeds too. Hmmm…. don’t think I’ll wait until next Easter to try those. Maybe next Sunday? P. S. Those darling little glass baskets belonged to my great-grandmother. I always fill them with jelly beans every Easter. Heat oven to 400 degrees F. Butter a 12-cup muffin pan. In a large mixing bowl, stir together flour, sugar, baking powder, nutmeg, and salt. In a small mixing bowl, whisk together the egg, cream, milk, and melted butter. Stir the cream mixture into the flour mixture until the batter is just combined. Divide the batter evenly among the prepared muffin cups. Bake for 15 to 20 minutes or until the muffins are pale golden and a tester comes out clean when inserted in the middle. Remove from oven, let rest a couple minutes, then turn out of pan onto wire rack. Serve warm. Makes 12 muffins. Thank you for sharing this recipe! It sounds delicious and delightful! I love nutmeg, too. And I like your idea of trying them with the cardamom! 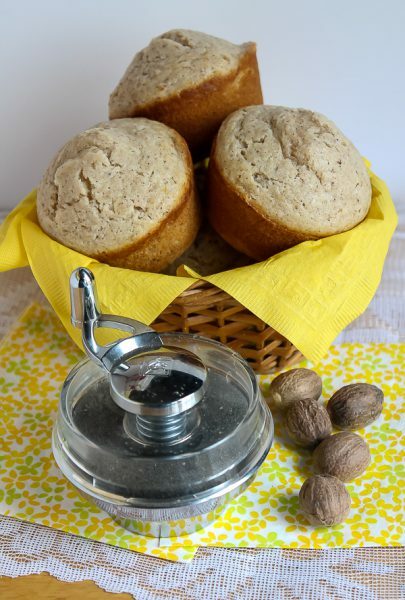 Both spices are wonderful in quick breads and muffins. 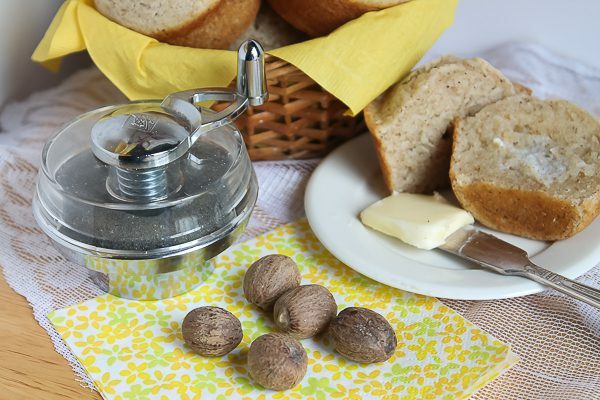 Love seeing you using your mom’s nutmeg grinder and your great-grandmothers glass baskets. It is special passing on those family treasures. Thanks, Kim! I’ll let you know when I try them with the cardamom. I’ll probably test them before the Finn cousins come in July.